Tasty Tuesday: A Guide to Smoothies! A smoothie is a wonderfully simple (and simply wonderful) way to start your day. Smoothies are healthy, cost friendly, quick, and easy to make. This is where we add the yogurt and ice cubes. I’ve chosen Greek yogurt (more protein, but less calcium). Greek yogurt is also thicker and will make for a hardier smoothie. Once again, the choice is yours. Add the ice, and the honey; blend and enjoy! *You can tweak the ingredients to your preference. For instance, if you prefer a thicker texture than use less liquid or more ice. Smoothies not only come in a variety of flavors, but also fit a variety of occasions. Whether it’s a quick breakfast, a convenient post-workout snack, or an afternoon treat; follow this easy guideline and you’ll agree, smoothies are the way to go! Give this recipe a try and let us know what you think! Be sure to check back in for more delicious, smoothie recipes! 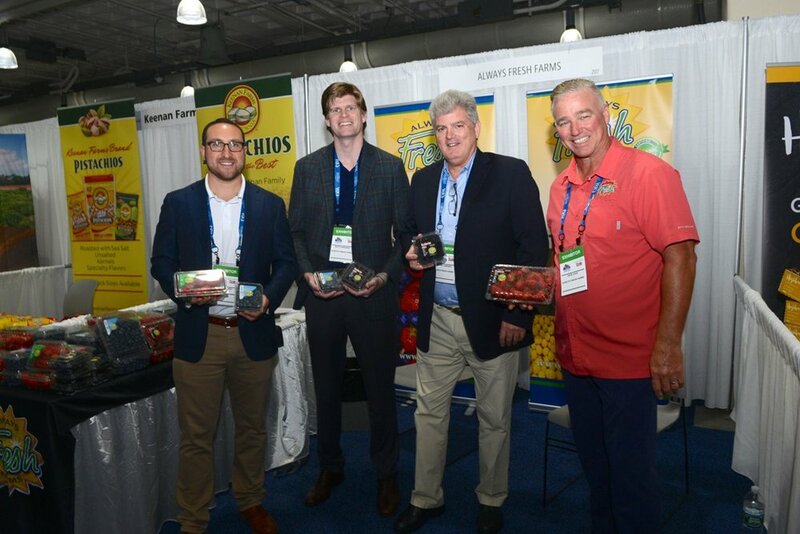 Always Fresh Farms staff shined bright at 2018 PMA Fresh Summit, in Orlando! Special “Thank you” to Miss Florida Citrus, Megan Price, for stopping by the booth. Keith Mixon Joins the Always Fresh Farms family! Always Fresh Farms is pleased to announce the addition of Keith Mixon, as a senior adviser to its executive team. Company President, Wayne Giddings, stated he is “thrilled to have someone of Keith’s experience and passion as part of our team”. Mr. Mixon and Mr. Giddings are no strangers to one another. Early in their berry careers, they were instrumental in the evolution of the southern blueberry deal; expanding consumption and production through innovative packaging, marketing and production initiatives while at their separate companies. Through these initiatives demand for blueberries during this period rose over 1000%. While friendly discussions turned serious, Wayne said Keith shared his desire to be a part of a dynamic company with both seasoned veterans and excited young “rain makers”. Keith felt Always Fresh had all the right ingredients to achieve its vision “to be the best berry company”. Over the past several years, Always Fresh Farms has added some exciting talent and as a result experienced significant success in blueberries, strawberries and blackberries. “Both growers and customers alike, seem to be very excited about the vision and success that Always Fresh is having. I feel they are poised for significant growth at this time. The Company ‘gets it’”, says Mixon. Improving the consumer experience through quality arrivals will be a priority for Always Fresh. “This requires us to align with suppliers that are willing to invest in this mission. At our own farms, we invest in the best varieties and operation practices to achieve this goal”, says Mr. Giddings. Mr. Mixon’s responsibilities will include but not be limited to: professional growth through mentoring sales and marketing people, working to improve administrative systems and processes, and overall strategies with both customers and suppliers. “Keith is joining us at an opportune moment; We have an incredible winter strawberry season planted, import blues and blacks heading this way, and experimental raspberries ready to start making their impact”, says President Giddings. Keith‘s love for the berry industry is well documented with his 20+ years, split between Sunnyridge Farm, and Dole Berry Co. Keith has been busy developing several Florida Citrus projects in his absence from the berry industry. He welcomes his new role and expects great things for the future. Keith’s direction and mentorship will benefit Always Fresh Farms to become "The Best Berry Company". Come say hello to Keith and welcome him back, at PMA; Always Fresh Farms booth #3330! Homegrown produce should cost less than fruit from Mexico or Chile, shouldn’t it? The reality is more complicated than “proximity to consumer”. In truth, many imports cost less than domestically grown equivalents. A tariff is a tax on imports and exports. Lower than average import tariffs in the U.S allow foreign companies to flood the market with fruits and vegetables from around the world. This may sound like a bad thing, but competition from imports keeps domestic prices low, which is a plus for consumers. The reason foreign companies can offer cheaper goods varies by country or region. Developing countries can sell their produce for less because of lower prices associated with the production, packing, and processing of fruits and vegetables. Particularly, lower cost of labor over-seas compared to rising cost in the U.S for energy, transportation, and labor allow developing nations to sell their products for less, even after the cost of international shipping. Average per unit production cost in China for citrus are one-tenth those in the U.S. In the EU, farm costs are similar to those in the U.S. However, most European governments offer subsidies (grants) or programs to keep farmers competitive in world markets. U.S producers are not afforded similar programs, which means the entire cost of production falls on the producer. Years ago, Americans could not enjoy melons in the winter, or blackberries come fall. 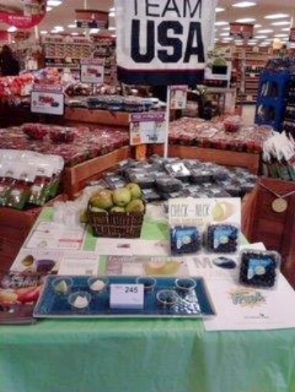 Thanks to innovations in transportation and refrigeration, American consumers have access to these fruits year around. The demand for counter-seasonal produce is high. Technical innovations in farming have allowed some domestic producers to grow produce in areas where they couldn’t in the past. However, the cost is often more (for consumers and on the environment), than purchasing overseas, where the product can flourish in its natural environment. American consumers will buy cheap goods, even if they are produced in countries that exploit workers. U.S Government regulations that protect workers by providing a minimum wage, access to health care, and workers compensation are all good things. But, many developing nations do not adhere to similar standards. American consumers would be (rightfully) outraged to hear of the exploitation of workers in the U.S, however we continue to purchase goods produced overseas through “slave” labor. Do we, as a nation, condone these practices, so long as they happen away from home? Why do we support (however indirectly) with our dollar, practices we disagree with? By introducing a variety of goods into the market, international trade can be a very good thing for consumers, but with great variety comes great responsibility. It is our job to do the research on the companies: to know where our goods are coming from and at what cost. The produce section of the grocery store floods you with many colorful options. Apples or oranges? Blackberries or blue? Why not throw a melon in there, too? In recent years, consumers have been forced to ask themselves another difficult and often confusing question: organic or conventional? · What’s the difference between conventionally and organically grown produce? · Does organic mean healthier? · Why is this stuff so expensive? According to the USDA’s website, organic is a term used to let consumers know that the food they are purchasing has been produced by approved methods. For a product to be labeled organic it must exclude production methods like genetic engineering and ionizing radiation. Also, organic foods must be produced following the National List of Allowed and Prohibited Substances. Not all organics are created equal. Organic labels can be misleading; just because something says organic does not mean all of its ingredients are. Foods labeled 100 percent organic are just that; 100% percent of their ingredients were produced in accordance with USDA’s standards. These foods include a USDA organic seal. If a product is labeled “organic” that means that at least 95% of its ingredients are organic. These products also include a USDA organic seal. Products may include a “made with” organic label if at least 70% percent of their ingredients are organic. They do not include the USDA organic seal. Is organic a healthier option than conventional? In 2012, Stanford University conducted an analysis of 237 studies that had been conducted in regard to the perceived benefits of organic versus conventionally grown foods. Researchers found little significant difference in health benefits between organic and conventional foods. However, Researchers did find organic foods had a 30 percent lower risk of pesticide contamination than conventional produce, though organic produce is not necessarily free of pesticides. · High demand and limited supply. · Alternative pest control methods to pesticides are often expensive and time consuming. · High cost of organic farmland and facilities compared to conventional. · Organic farming materials (i.e. green manures and legumes) cost more than conventional materials. · Conventional farming methods are more effective at garnering higher yields of crop than organic farming practices. Should I purchase organic or conventional? Read the labels, make sure you know what you’re buying. Remember the differences between “organic” and “made with” organic. Many consumers purchase organic not because of health benefits, but the potential effects of pesticides on the environment. Ultimately, the choice is yours. Fortunately, here at Always Fresh we offer both organic and conventionally grown produce. (from left to right) Greg Kosofsky, Matthew Giddings, Wayne Giddings and Jack Cain show off some beautiful berries at the NEPC show in Boston. Be sure to ask your local grocer for the “Always Fresh” brand. 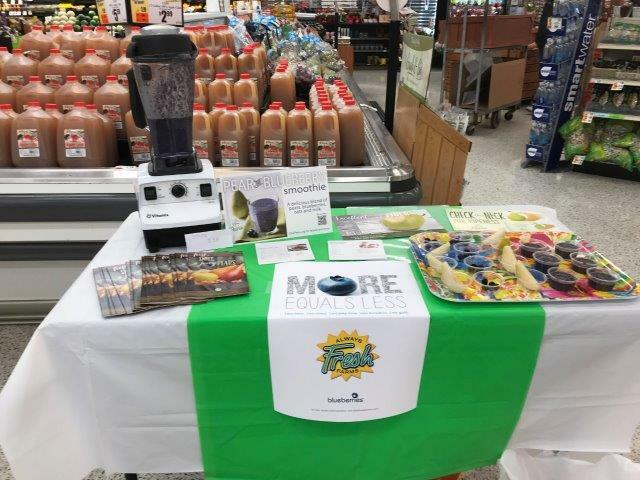 Always Fresh Farms teamed up with USA Pears for a delicious showing of how the 2 fruits (blueberries & pears) work together in a scrumptious smoothie, in Tops Market stores throughout the Northeast. Recipe below: try it out & let us know what you think, @Always_Fresh_Farms! This is the ultimate breakfast smoothie, combining pear, oats, blueberries, and milk. Think of it as a hearty bowl of oatmeal packed into an easy, mix-and-go beverage. The smoothie requires no added sugar, thanks to the sweetness of the fruit, and the cinnamon is a perfect complement to the other flavors. Place all of the ingredients into a blender and puree at high speed until smooth and creamy. Southern Exposure proves to be a "jailhouse rocking good time" for Always Fresh Farms! Vice President of Sales, Jack Cain, recently visited 2 of H.E.B's Austin, TX locations. Jack made the trip to TX to promote the delicious Indian River, red & white grapefruit varieties. Did you know: February is National Grapefruit Month!? Don't miss out on these juicy treats- ask your local grocer today! Always Fresh Farms salesmen Matthew Giddings & Gregory Kosofsky. Proud sponsor of the 2018 Magical Garden Dinner Dance, hosted by the New England Produce Council! Always Fresh Farms was there in full force! Kudos to our QC & growers- nothing but great feedback on berries! What a great weekend at @packernews ‘s #GOPEX! We are so excited for next years show!